Roger Moore had a uniform, and it wasn’t the safari suit! It wasn’t the dinner jacket or the trench coat either, though he loved those too. 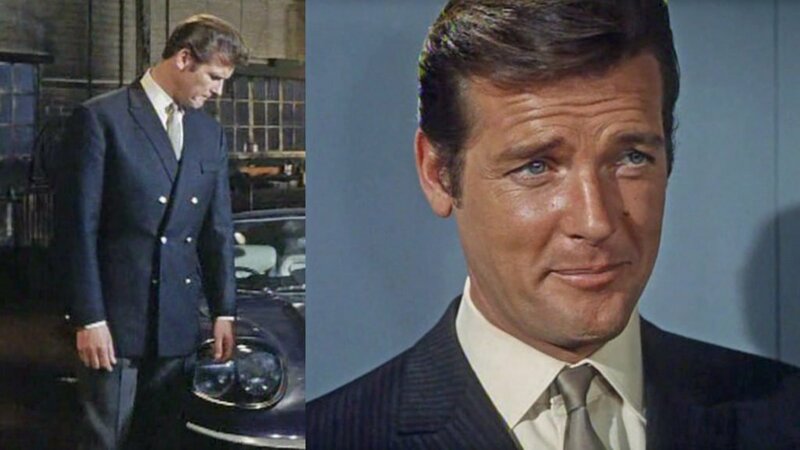 The blue blazer was Roger Moore’s true uniform, and he wore it in many forms more than anything else, both on and off the screen. Throughout his long life, he frequently reached for a blazer for almost any occasion that didn’t necessitate black tie. Moore routinely demonstrated how versatile the metal-buttoned blue blazer is, and he wore it for countless roles, television appearances and public events. Elegant, versatile, traditional and dressy-but-fun all describe the navy blazer, and all of these traits of the blazer are why it perfectly suited Roger Moore. Moore was always perfectly dressed wherever he wore it, not only because of the blazer’s versatility but because it was the garment that best suited his personality. It was particularly pleasing to see Roger featured in GQ‘s 2015 list of Best Dressed Men – not many octogenarians receive such an accolade… particularly when they have previously been the subject of ridicule for their sense of style. The safari jackets and flared trousers of the 1970s have received much derision, but they were right for the time. 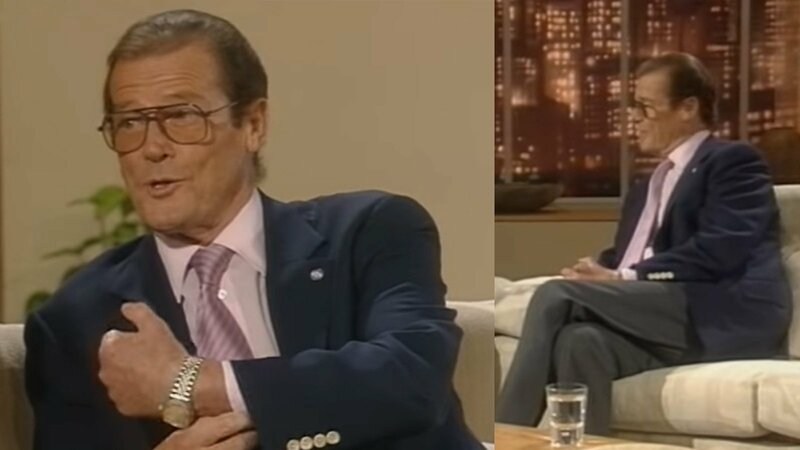 It is amusing to see the current popularity of short, belted coats with patch pockets and flaps (now referred to as field-coats), and when the fashion for trousers with wide bottoms returns (which it will at some point in the future) Roger Moore will be celebrated as the style icon that he has always been. It all started with the first episode of The Saint, “The Talented Husband”, in 1962. 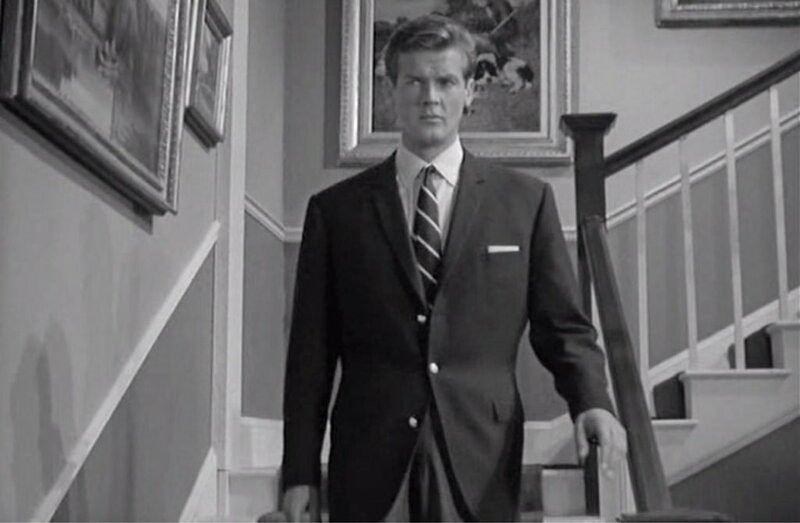 Cyril Castle made for Moore a few almost identical navy blazers over the course of the the four black-and-white series of The Saint, which Moore wore more than anything else in those episodes. He particularly favoured these in the British countryside and abroad. These blazers had very narrow 1960s lapels and three buttons, of which Moore only fastened the middle. Castle cut these blazers with soft shoulders and a strong, swelled chest to give Moore a powerful yet relaxed look. It had straight flapped pockets with a ticket pocket and a single vent at the rear. He typically paired his blazers with mid grey flannel trousers, a pale blue shirt and a striped tie. 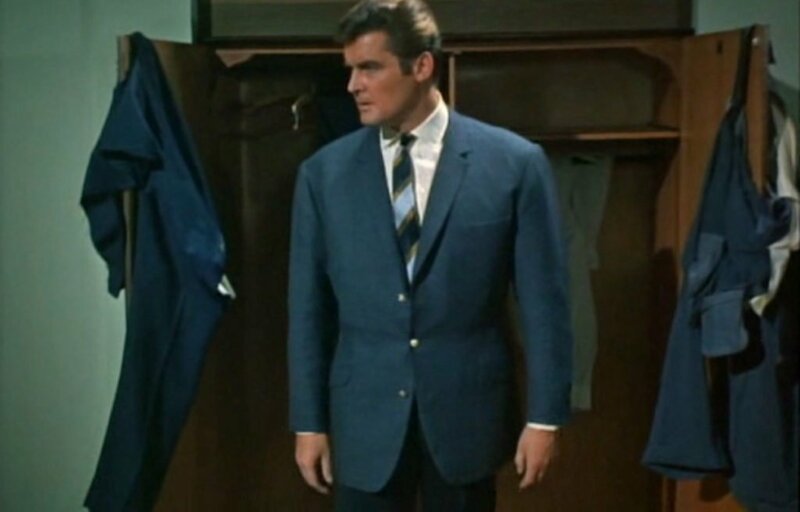 For a special two-part episode of The Saint filmed in Malta titled “Vendetta for the Saint”, Moore wore a blazer in air force blue made by Cyril Castle. This unusual colour for a blazer wouldn’t be such a good choice for cool and cloudy Britain, but this lighter and warmer blue is perfect for both the sunny Mediterranean as well as for Moore’s warm complexion. It is tailored with soft shoulders, a full chest and a suppressed waist and is detailed with silver crested buttons, double vents, hacking pockets and turned-back gauntlet cuffs. He wears it well with both mid grey and charcoal trousers, a cream shirt with button-down cocktail cuffs made by Frank Foster and a striped tie. Moore’s first double-breasted blazer, which he wears in the final series of The Saint, is an unusual cloth of navy herringbone with thick green and orange stripes—there are two green stripes to one orange stripe. These stripes are not the kind that would be found on a business suit, and that is why they are effective on this blazer. Moore wouldn’t dare wear a pinstriped of chalk striped jacket as a blazer! This blazer by Cyril Castle features his signature double-breasted cut with a narrow wrap (overlap), which lends Moore a slim yet athletic shape. It has soft shoulders, a full chest and a suppressed waist with double vents, hacking pockets, and gauntlet cuffs. Pictured here in the final 1969 episode of The Saint titled “The World Beater”, Moore wears it with grey flannel trousers, his typical cream cocktail cuff shirt of the time made by Frank Foster and a silver satin tie. In another episode he wears it with an unusual roll-neck shirt that has double cuffs. Roger Moore had the pleasure of designing his own wardrobe for his early 1970s television series The Persuades. For this series he opted for a non-traditional striped double-breasted blazer in colours other than blue. So it hardly counts as a blue blazer, though it does have metal buttons. But he also wore a navy blue blazer in the series in the form of a double-breasted knitted cardigan blazer. This is a casual variant of the blazer that has seen occasional popularity in Italy. It allows Moore to dress down while still wearing his signature look. He often wore it with a Frank Foster button-down-cocktail-cuff shirt and tie like he would any other blazer, but it also paired naturally with a roll-neck for more casual use. Moore’s first blue blazer as Bond in The Man with the Golden Gun and Cyril Castle’s last blazer for Moore is inspired by James Bond’s naval history and is cut like a naval reefer jacket in a button three, show three (6×3) model with shanked silver buttons. If a blazer didn’t already make someone look like he belongs at sea, this one does. It has hacking pockets, deep double vents and unique flared link cuffs. Moore first wears this blazer with grey trousers, a blue striped Frank Foster shirt with cocktail cuffs and a light blue tie, but he later switches those items out for cream trousers, a cream shirt and a striped tie for the ultimate naval look. Moore’s blazers were brought thoroughly into the 1970s by Angelo Roma with wide lapels, padded but narrow shoulders and a leaner cut through the chest. This dark navy hopsack blazer from The Spy Who Loved Me has a modern variation on the classic shanked metal buttons; sew-through silver-toned metal buttons update the blazer without dishonouring the tradition of metal buttons. Moore wears the blazer with off-white trousers for the ultimate maritime look when at sea. He wears a blue striped shirt with “Lapidus” tab cuffs from Frank Foster and blue shantung sill tie with it. 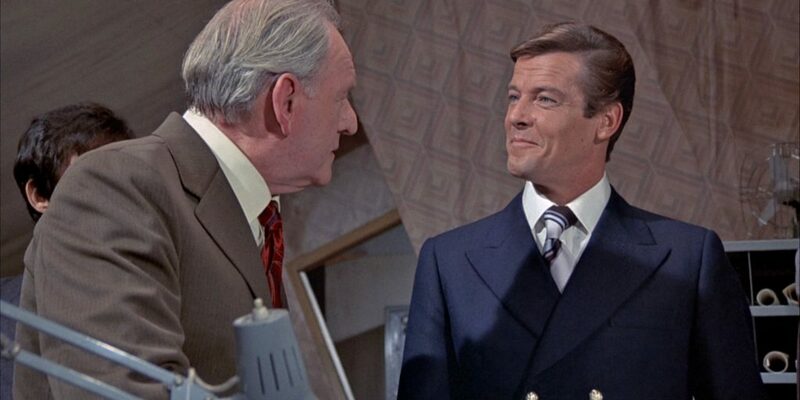 In Moonraker he wears a similar blazer on two occasions with striped ties and beige and tan trousers. The double-breasted blazer returns at the start on Moonraker, again from Angelo Roma. This one has sew-through, brass buttons in a classic button two, show three style with unconventional, fashion-forward notched lapels (instead of the traditional peaked for a double-breasted jacket) that are wide enough to keep him soaring through the air while skydiving! This blazer is detailed with double vents and flapped patch pockets on the hips. Moore dresses it down with mid grey flannel trousers and a cream rollneck. For the 1981 film The Cannonball Run, Roger Moore plays a man who thinks he is Roger Moore, so he needs to dress exactly how we’d expect Roger Moore to dress. That of course means there is a navy blazer involved. This brass-buttoned blazer has an English-inspired cut—straight shoulders with roped sleeve heads, a nipped waist and a flared skirt—with classic American details—patch pockets and a single vent. 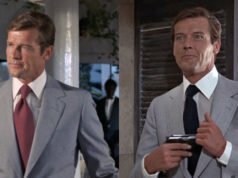 We don’t know who made it, but with an open-neck blue shirt and beige trousers, Seymour Goldfarb, Jr knows how to dress just like Roger Moore. With the more traditional fashions of the early 1980s came a new classic double-breasted blazer for Moore. 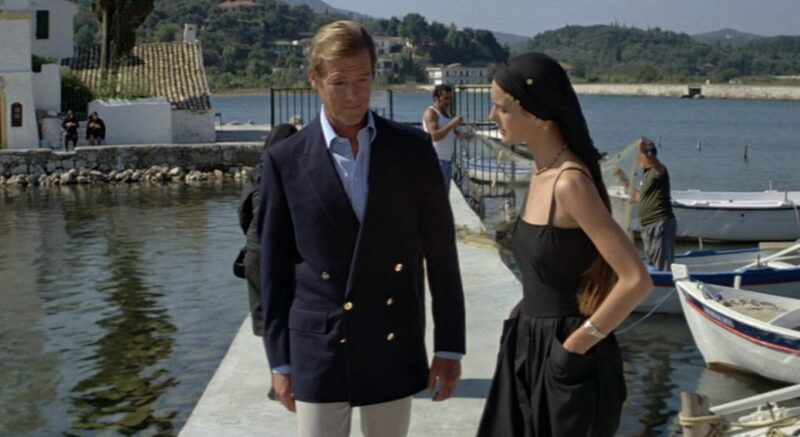 Douglas Hayward was now Moore’s tailor and made James Bond this button two, show three navy blazer with brass buttons to wear for a fun and romantic afternoon in Corfu. The cut is softer than what Moore’s Italian blazers featured and is more relaxed for a more mature Moore. It has soft shoulders and a very low button stance and may have been better if the bottom row of buttons were omitted. It is classically detailed with double vents and straight flapped pockets. Moore wears it with stone-coloured gabardine trousers and an open-neck blue shirt from Frank Foster for a sporty Mediterranean look. 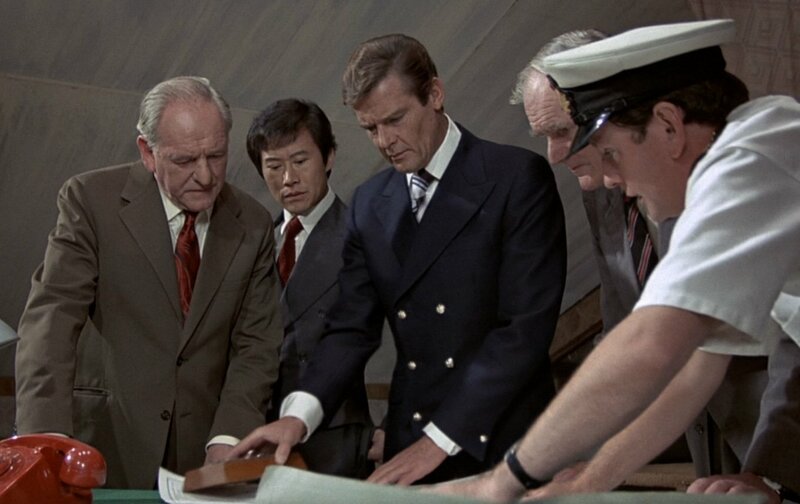 Douglas Hayward made Roger Moore a classic button two single-breasted blazer with shanked brass buttons to wear in his final Bond film, A View to a Kill, but it’s in a lighter and more teal shade of navy. Though the colour is slightly different from the classic dark navy, it’s just as versatile. The blazer has soft shoulders, a gently fitted cut through the body, straight flapped pockets and double vents. Moore would continue to wear this blazers and many others like it in his personal life after this film. Here he wears the blazer with an uncharacteristic white shirt from Frank Foster, a day cravat and beige wool gabardine trousers. For most of Moore’s appearances over the 20 years following his Bond career, he wore button two single-breasted blazers, similar to what he wears in A View to a Kill. Most, if not all, of these blazers were made by Douglas Hayward in a similar cut and style to the blazer in A View to a Kill. Some blazers had single vents and some had double vents. The buttons on most of them were gilt metal, except for on one blazer that he wore for a 1994 appearance on Des O’Connor Tonight. This blazer is graced with white mother-of-pearl buttons, which are perfect for a summer blazer. He wears the blazer here with dark grey trousers, a pink shirt and a mauve striped tie. 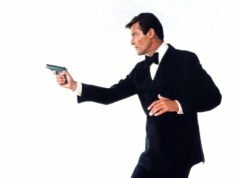 Roger Moore wore a new blazer when he received his star on the Hollywood Walk of Fame in 2007. This is the first of four or five double-breasted blazers that Moore would wear in the last decade of his life. Moore was still a patron of Hayward until 2012, and though he took delivery of this blazer before Doug Hayward passed in 2008, Hayward himself would not have cut this blazer. The blazer has straight shoulders, a higher button stance and a low placement for the hip pockets, so it doesn’t even resemble Hayward’s house style and may not be from them. Straight, padded shoulders are more flattering for Moore now as they balance his more filled-out figure, but the whole blazer looked a bit too stiff for Moore’s personality. For this special occasion pictured here, Moore wears the blazer with grey flannel trousers, a white shirt and a navy and yellow striped tie. It is difficult to express what an honour it was to follow in the footsteps of such legends as Cyril Castle and Doug Hayward to dress Sir Roger, or for the sadness that is felt for the loss of such a wonderful man. We began to make his clothes soon after the relaunch of Anthony Sinclair in 2012. In addition to the suits that we tailored, his favourite outfit was the trademark navy blazer and grey flannels. His blazers were cut with ease for comfort (and to accommodate his barn-door shoulders) but the double-breasted style and brass buttons created an appearance of formality. It was a look that could (and did) take him anywhere. Moore’s final double-breasted blazer was cut more traditionally than the one mentioned just above, with a lower button stance, lower gorge and slightly softer shoulders that gave the blazer a more natural and relaxed look that perfectly balanced his body and better suited his personality. 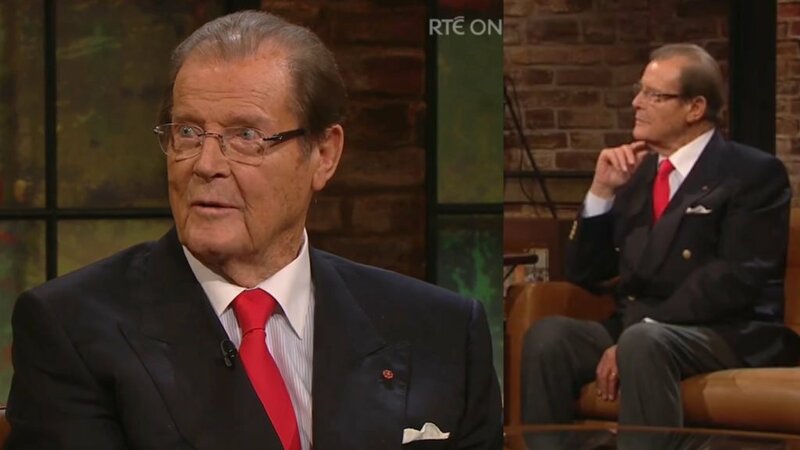 Pictured here from Moore’s appearance on Ireland’s The Late Late Show in October 2016, he wears it with grey flannel trousers from Anthony Sinclair, a light grey striped shirt from Eton with white collar and cuffs, a scarlet tie and navy canvas shoes that stylishly help him walk better at the age of 89. Even at the end of his very long life, Moore kept the standards of how he dressed at the highest level. This is an article I had been waiting for Matt. I knew you would get to writing about Moore’s uniform of a blue blazer and grey flannels eventually. It is a look I often wear myself, as it is so versatile, i can dress it up with a tie for work during the day and wear it more casually open-necked for a more social occasion. My grandfather was a big roger Moore fan and copied a lot of Moore’s signature looks, he is still quite of a fan of the blazer and slacks himself. Cyril Castle was still around in early 80s when Roger Moore switched to Doug Hayward ? I believe Cyril Castle was still tailoring Frank Sinatra at the time. But Roger Moore stopped using Castle after The Man with the Golden Gun. Top grades, Matt as per usual. Thank you. It’s corrected now. As the Devils advocate, did sir roger ever wear a black blazer? Moore changed tailors because he was a tax exile and Cyril Castle would not travel from the UK visit him in the South of France. So Moore found an Italian tailor instead since he had an Italian wife. He only used Angelo for about five years, and then he found Douglas Hayward, with whom he had a much more personal connection with. After Hayward passed, I don’t think Moore felt much of a reason to stick around with the firm, though he did for a few years before he met David Mason. If someone has a great tailor, there’s no need to change. I love your articles and this site is one of my favorites!! But what shoes did wore with his blazers? I know he used to wear a lot slip-ons, but where they black or brown? Moore typically wore slip-on shoes. They were black with grey trousers and brown with earth-toned trousers. If you click on the links within the article you can learn more about some of the outfits. Thank you Matt!! Keep up the good work!! What an inspiration. I feel as though my own style has lapsed recently, often dressing down like wearing business suits without ties, dark shirts with dark suits, and other little casual feux pas. My thought process was along the lines of “what’s the point in dressing well ALL of the time?”. After seeing Moore and the care he put into every outfit right up until his final days has really brought back that sartorial spark in me. Time to purchase some navy blazers! The Hayward blue blazer from 1994 Matt looks like a light navy, not a true dark navy. Looks like more of a summer blazer. The mother of pearl buttons are great and show they don’t have to be metal to work with a blazer. I dont think anyone has ever worn navy blazers as well as Moore, and among the other thee Bond’s who wore them only Lazenby comes somewhat cose in terms of style and panache. Among tailored garments it may be my personal favorite for the very reasons mentioned in the article and as such I feel it is important to carry on the tradition of this important piece of men’s clothing. Just as with the kindness and healthy dose of self awareness and humor that Sir Roger possessed, this is something we can not afford to loose. The man sure had style. 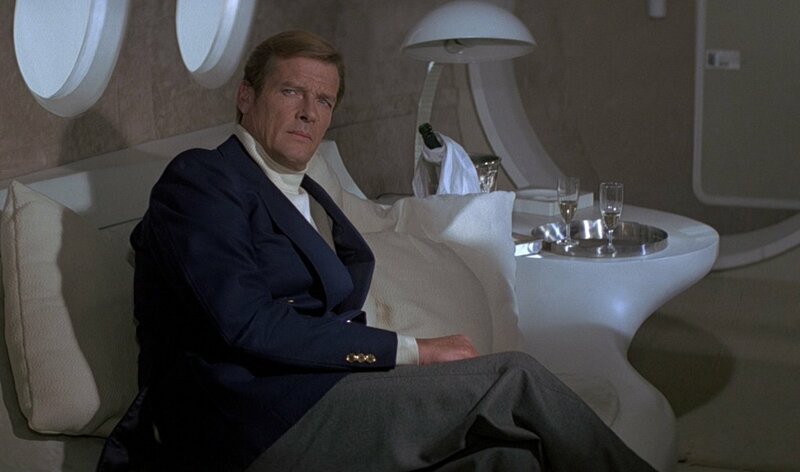 In my opinion, Moore never looked better than in the navy blazer from Angelo Roma in The Spy Who Loved Me. That cut and fit of that piece was exquisite, and the perfect match for Roger’s build and age at the time. Another excellent article and a fitting sartorial tribute to the man. With so many incarnations as displayed here it shows why, as Hagensen points out, this versatile classic should be kept, though any form of quality tailored clothing seems to be thinner on the ground as the years pass. The little variations in terms of colour, style, buttons etc are what make the blazer so interesting and one could have several which may, at first glance, seem almost identical but which, on closer inspection, reveal their individual features. I think the DB blazer from The Saint with the subtle stripe is a beauty. I have a few blazers on the go myself and the mother of pearl version will be a future garment for me. Personally, I find the examples which he wore, post-Hayward, from 2007 on, to be less inspiring to my eye. They lack something. They certainly look expensive (I believe Roger wore Brioni blazers too sometimes) and don’t want on quality but Hayward’s cut was exquisite and suited Roger better than the more defined shoulder and boxier style. Indeed,someone once commented, as another put down of Moore’s acting skills, that he’d only ever win an Oscar if they invented a category for “Best Blazer and Slacks”. This was an inverted compliment as you’d be hard pressed to find anyone who wore this ensemble with more flair and panache than Moore. I have a question which may apply to the indivisuals that do not shop at the retail stores. I was looking for an old army jacket at a surplus store when I came across a thick navy blazer silver buttons. I thought it looked great. I took it to my tailor and he sized me up and tailored it very nicely. Upon inspection of the inside label he found out that the blazer was actually part of a naval uniform company back in the 70s. So my question is safe to and cruelly wear naval uniforms as a blazer? I went for the george lazenby look, but I want to know if this is just ridiculous or worth while. If it doesn’t have rank insignia markings, I think it’s okay. PS: there was a couple of other blazers featured in The Persuaders other than the cardigan version and the striped one. 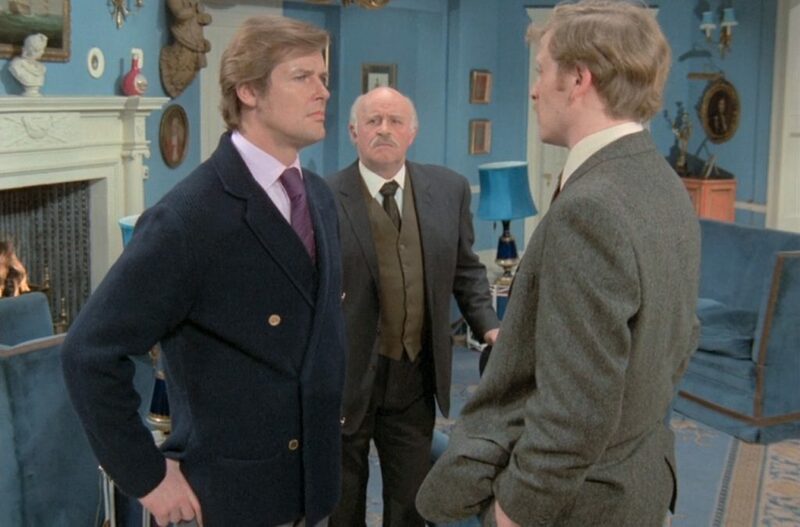 In at least one episode; “A Death in the Family” and possibly “The Long Goodbye” he wore a plain navy DB similar to the DB Saint blazers but without the flapped breast pocket and striped material. Also, briefly, he wore a mid brown SB blazer at the start of the episode “Nuisance Value”. An interesting example of a true blazer with metal buttons in a colour more often associated with regular sports coats. However, I think this post is concerned exclusively with the classic blue blazer. On top of all these variations, Moore wore a navy, single breasted, peak lapel one in this interview. Do you think wearing a blazer is more elegant than wearing a complete suit? What does the blazer say? I ask because you mentioned in one of your articles that whenever talking to someone about financial issues one should wear stripes. Rules like that make dressing for the occasion so much easier. A blazer and a suit can be equally elegant, they just don’t serve the same exact purpose, though there is overlap. I don’t think I ever said that one should wear stripes whenever talking to someone about financial issues, only that stripes may have banker connotations. Is there any occasion where a blazer should or shouldn’t be worn? Blazers are good for social occasions when a suit may be too formal or serious but you still need to look dressed up. Just something curious Matt, But what do you think is the best or your favorite blazer Roger Moore wore in your opinion? Do you have any idea of the make/brand of Sir Roger’s ties – especially the stripes he wore later in life? The later ties were sourced from Douglas Hayward.